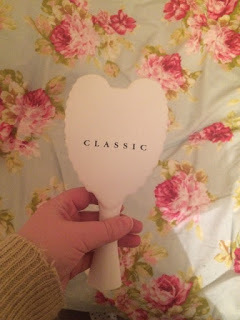 When I saw a competition via Facebook that a Sea of Salons were running to win 1 of 20 Tangle Angel Classic brushes they were giving away I was keen to enter. I've never had a "Tangle Teezer" before. Mainly because I've never found one I can hold properly (my hands are that small yes...) and so once I'd learnt that Helen from a Sea of Salons were gifting me one, I was definitely eager to give it a try! It's handle makes it much easier for me to use and it's shape means you can also have a good grip of it from the top of wings when you need a firmer hold (or when you're having a blood bad hair day). The bristles on the actual brush are so soft and there's no pulling at all. After one full head brush straight out of the shower, when my hair is at it's waviest and extremely knotty, I found that the whole time I was blow-drying my hair it didn't need brushing again at all. This is completely different to my ordinary brush as my hair is constantly getting tangled during the blow dry. Tangle Angel claims to be heat resistant, anti-static, water-resistant and anti-bacterial. I found that it was indeed anti-static, which is amazing when you have hair as thin as mine! However, the anti-bacterial claims I'm not sure what this would mean. Sounds good either way doesn't it? 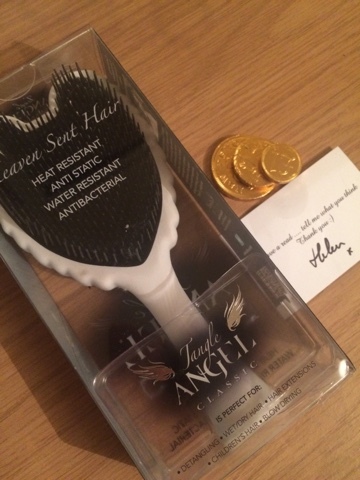 I noticed that the hair which was coming onto the Tangle Angel Classic after one brush were so easy to remove. Normally with the paddle brushes I am used to, I have to get another comb to brush all of the excess hair out and keep it clear. This I find very handy as I'm very particular about hair being stuck as it is. The bristles are so gentle and soft that you don't even receive that head pull when you violently have to tug your way through the knots. My hair is bleached, thin and quite long and so finding a good brush you could say is one of my priorities. Its compact size makes it ideal for your handbag rather than the chunky paddle brushes I have become accustomed to. I must admit, I didn't expect much from the Tangle Angel Classic yet after a week's use, it's safe to say that I stand corrected. I have been converted! 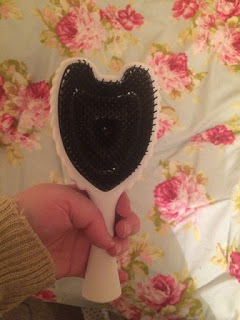 Gone is the chunky paddle brush, and in is the Tangle Angel! Thanks so much to Helen at a Sea of Salons for the amazing gift! If you're still struggling for those last minute stocking fillers, Tangle Angel will fit in there nicely! Find a Sea of Salons on Facebook here.